Our finest roof-prism binocular. ED objectives eliminate chromatic abberation for flawless color rendition. Phase-coated prisms for highest-possible image quality. Wide FOV. Internal focuser focuses down to just 6 ft.! 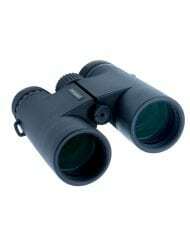 Perfect for advanced-level bird-watching and wildlife viewing. Available in your choice of 8x or 10x magnification. Magnesium-alloy construction with attractive textured dark green rubber armor, with red anodized trim. The focus wheel and diopter ring is aluminum (most other brands use plastic). Like the Sport HD Series, the Sport ED’s are completely waterproof. 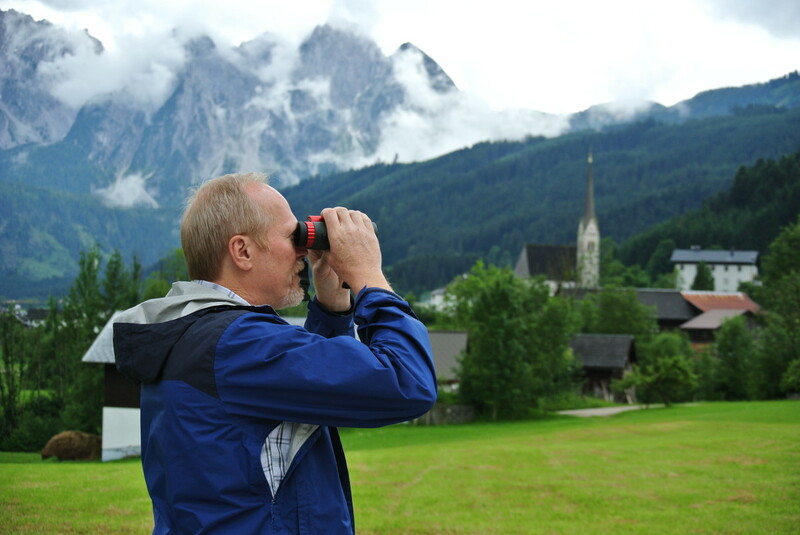 The internal focusers have the widest range of any Oberwerk binoculars, allowing them to focus as close as 6 ft. away! Oberwerk’s signature broadband multi-coatings are found on every air-to-glass surface (fully multi-coated), and the prisms are phase-coated for highest-possible image quality. The eyecups are continuously adjustable- simply twist to move them in or out. Includes right ocular diopter adjustment, soft rubber ocular cover, captive soft rubber objective covers, rugged nylon case, and our premium heavy-duty denim strap. Read noted camera reviewer Ken Rockwell’s review of the 8×42 Sport ED. My eyes are very relaxed and I can look through them for a long time. I attribute this to the a couple of things. Eyes don’t have to be lined up exactly in the center of the eyepiece to see the whole field of view – no black out if you are off center. Natural 3D view which I attribute to their precise collimation. Early or late, shade or sun, I see no “color fringes” on birds, twigs or any object in the field of view. They are able to focus precisely and have crisp detail. I don’t have a $1000 plus pair of binoculars to compare them to but don’t feel I’m missing anything. They feel compact, light weight and balanced to me. I have no trouble holding them stable enough. I don’t find myself looking for a place to brace myself to hold them still. Other observations: Large diameter focusing knob helps precise focusing. Field of view is probably not adequate for finding fast flying birds at close range, but fine for soaring raptors, flocks of ducks and geese and larger birds at a distance. Armor coating comfortable to hold. No wobble in hinge and it’s both tight and smooth. Once it’s adjusted, it stays there. Can’t comment on twist out eye cups as I use glasses and leave them all the way in. I would certainly recommend them and buy them again. 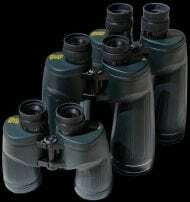 I bought a pair of Oberwerk 10×42 Sport ED with a 6.5 FOV. I love them. They were great during our Antarctica trip and have been during the African Migration I am currently on. I’ve recommended them to others I am so pleased. I received the 8×42 Sport EDs a couple days ago. They came with a paper indicating Kevin Busarow’s (owner of Oberwerk) personal measurement of the alignment of the barrels. 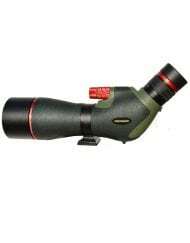 Out of the box, the Sport ED is a beautiful binocular to behold with it’s red, aluminum adjustment rings against the dark green body. Upon first use, which was daytime, I was amazed how light and easy they were to hand hold without shaking. They are much lighter than I remember my Swift HHS 8.5×44 roofs and with a wider field of view. I focused on a corner of a white roof and was rewarded with a view of perfectly aligned roof shingles. There was slight chromatic aberration but only at the edge of the field. It was less than half of the chromatic aberration of my 10×50 Ultras obviously due to the ED glass in the Sport EDs vs. the Ultras, which do not have ED glass. 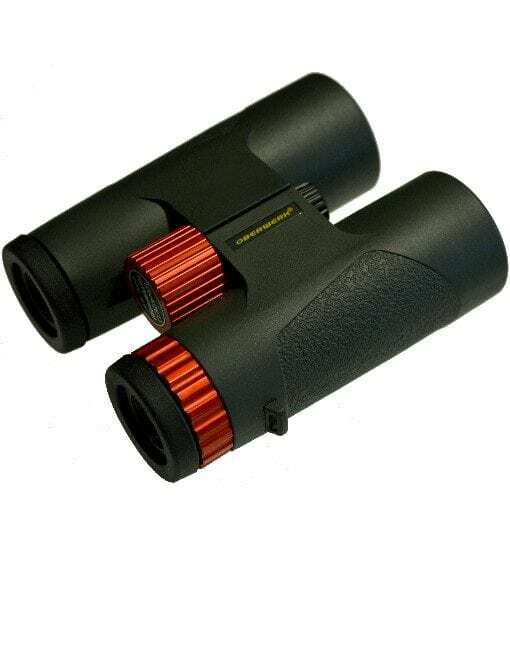 Neither binocular had chromatic aberration in the center. The Ultras had a lot more chromatic aberration at the edges. This morning, I brought my brand new Sport EDs to the local Audubon store to compare with their Swarovski, Zeiss and Nikon Monarch 7, each of similar specs. Still daytime but of birds at feeders–unfortunately through a glass window. The Sport EDs held their own against the Nikons. The Zeiss and especially the Swarovski’s seemed to be just a little more comfortable to use. Focusing seemed to take a little longer in the Sport EDs and that could be that the focusing mechanism was a little less smooth or maybe there was less depth of field but it was hard to tell. The ability to focus quickly is important in birding obviously. 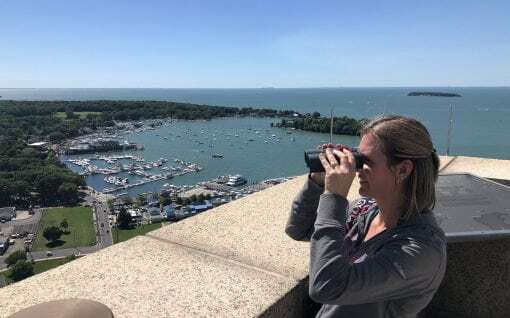 Hey, we are talking about $300 binoculars vs. $1.5-2.5K binoculars. As far as I could tell, brightness and sharpness were up there with both the Zeiss and the Swarovski’s. 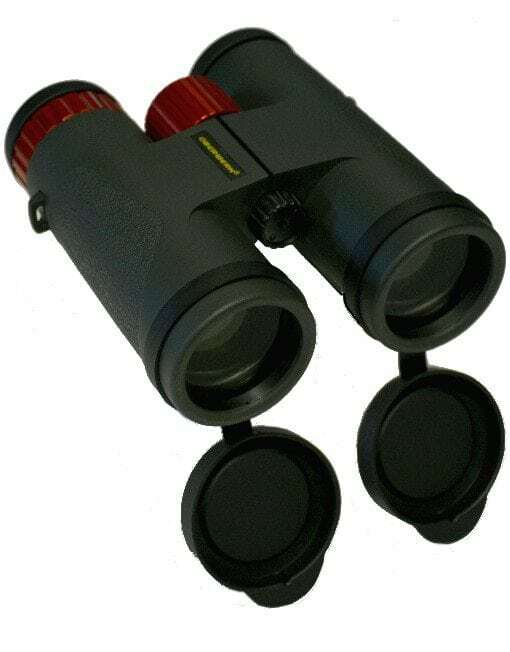 The Sport EDs were noticeably lighter than the other binoculars due to the magnesium housing and this is certainly a plus. Tonight, I tested the Sport EDs against my 10×50 Ultras and 15×70 Orion Resolux (same as Ultra) looking at Jupiter. Jupiter is a very challenging test for any astronomical instrument. 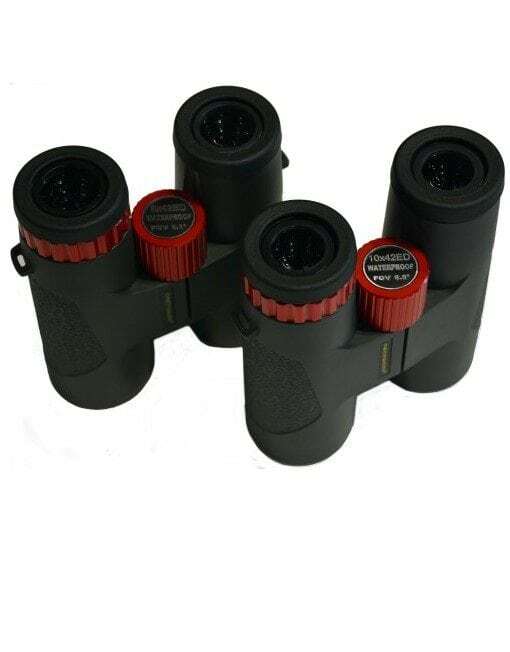 Having these three binoculars gives me a nice range of magnification (8x, 10x and 15x). I had them on tripods and I was sitting. I have to say, although, of course, the image of Jupiter in the Sport ED was smaller, it was just a little sharper than either of the larger binoculars. As well, there was noticeably less chromatic distortion. Stars were pinpoint in all the binoculars. 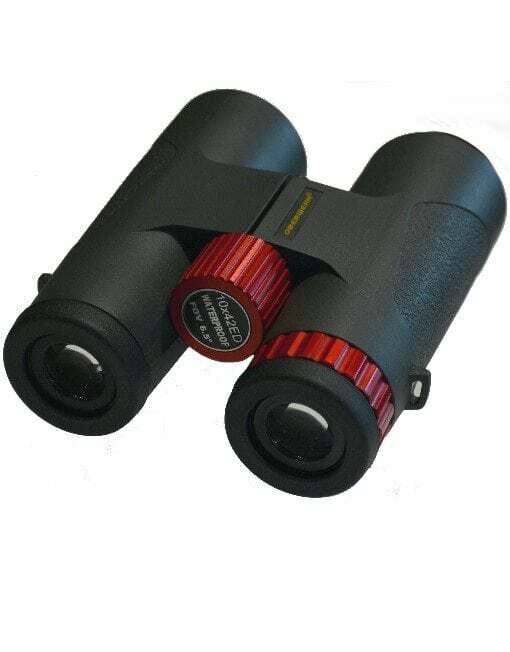 I was looking for a cheap birding binocular and was considering Oberwerk’s 8×40 Porros at roughly half the price of the Sport EDs. Kevin convinced me to go for the Sport EDs and I am so glad he did. Chromatic aberration is practically non-existent, which is important in birding. As well, there is no light loss throughput, which is important when it is getting late in the afternoon or when you are looking in the shadows. Kevin explained that these binoculars incorporate a robust prism system so that the binoculars are unlikely to fall out of alignment. 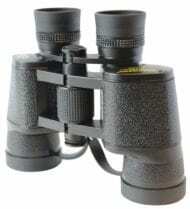 I rate these Oberwerk Sport ED binoculars excellent and probably on a par with the Nikons at twice the price. 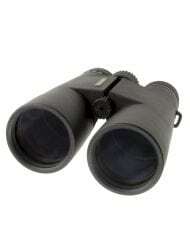 I purchased the 8×42 SED primarily for bird watching. The binoculars sit on my desk which overlooks large window showcasing a tree with hummingbird feeder hanging from one of the branches. The 8×42 SEDs are perfect for the task. They are lite and very easily focused. It is easy to track the hummingbirds and re-focus as they go from branch to feeder to flower. The color is excellent, and the image is sharp. 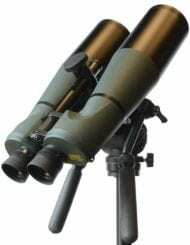 At night I use them to scan the night sky. 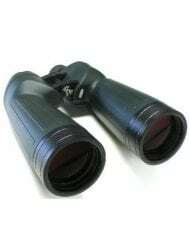 Being 8x binoculars, they don’t have the power to tightly zoom in on the treasures of the night sky, but they are excellent for general scanning of the sky. The ED glass is worth the upgrade. 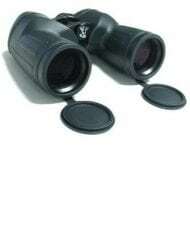 These are wonderful binoculars. Highly recommended.